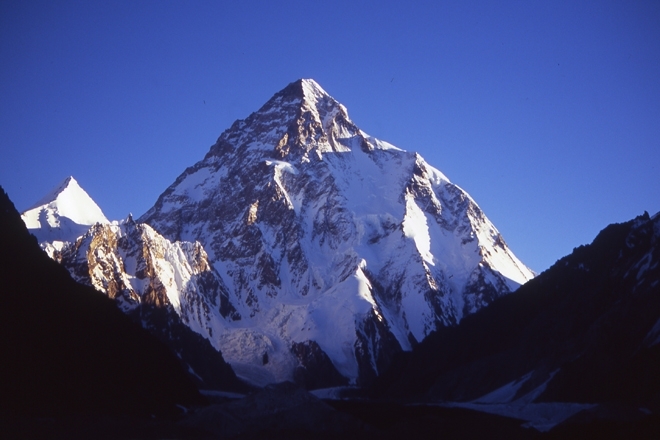 K2 is the second-tallest mountain on earth, without doubt one of the deadliest to climb, and even the trek to stand beneath it is not for the faint-hearted. Anyone who loves the mountains and epic climbing tales will be familiar with the dazzling line up of big peaks that pave the way to K2 Base Camp, and back in 2004 I was no exception. I joined Mountain Kingdoms in the spring and jumped at the chance to fly to Pakistan that July as Assistant Leader with a group of 12 clients heading first up toward K2, and then over the icy Gondogoro La (5,938m) and down in the lush Hushe valley. We had a brief afternoon of sightseeing in hot, sticky Islamabad before heading off early next morning to commence our long two-day journey up the Karakoram Highway. The scenery was spectacular, as was some of the driving as the road became narrower, and the grey Indus River dropped steeply away below us. The mountains banked high above us on either side, strewn with precariously balanced giant boulders and audacious mountain goats. Eventually, stiff-legged, we reached the dusty fortress town of Skardu and enjoyed pre-trek drinks in the lush garden of our hotel looking out over the lazy curve of the Indus toward the hazy peaks in the distance. Another day on the road, passing heavily-laden apricot trees and dodging landslide debris, brought us to the simple village of Askole, where we met our smiling team of porters and our trek began. The first days were hot and dusty, but eventually the air cooled and the peaks began to reveal themselves, an impressive who’s who of big mountain names: the renowned Trango Towers, commanding Cathedral Peak, lofty Masherbrum and many more. The undulating ice and rocky route up the glacier was easier underfoot than I had initially expected, despite some scrambling in places, however the trekking became increasingly hard work as we gained height and the air became thinner and thinner. Arriving at Concordia though was sensational, a magnificent mountain amphitheatre and, despite it being well below freezing, I recall sitting outside my tent watching the moon cast shadows on the surrounding peaks long into the night. Our trek in Pakistan was not without drama, the starkly beautiful landscape was also extremely exacting and three of our group did not continue over the pass. The trip highlight for me though, without doubt, was standing in the ‘throne room of the mountain gods’ at Concordia with K2 towering above me - I have never felt so small and insignificant as I was there, humbled by the incredible might of the Karakoram Himalaya.